When I sounded off in HFCS Corn Wars about the ‘artificial sweetness’ of the ubiquitous HFCS ads, I promised I’d have our own nutrition correspondent, Rebecca Scritchfield weigh in with her professional analysis, but first…you MUST see BlogHer Gena Haskett’s insightful piece on the way we should consume advertising. It’s straightforward, erudite, balanced, and oh, so wise…Couldn’t have said it better myself! And the readers commenting are equally sharp. Take a peek. There are some brillliant snippets of Web 2.0 media literacy worthy of ‘point/counterpoint’ deconstruction that I’d like to share. While I’m at it, I’d like to point you to the King Corn site and documentary, which I bought at the Champions for Change state health conference and will be screening in house party format, in addition to Two Angry Moms and others in our Shaping Youth fall film fest for parent-youth education! 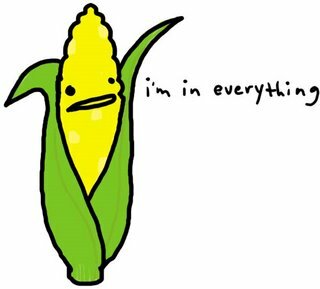 As the pbs independent lens features and Rotten Tomatoes reviews, King Corn is about “two friends, one acre of corn, and the subsidized crop that drives our fast-food nation,” and let me tell you, it’s an eye-opener. That’s right, folks…As you’ll see in my own media literacy phraseology, I fall into the ‘stakeholders’ tier. Remember, that’s where my opinions belong…no more, no less. First of all, it included a vast sampling of 37 people, which when split into 5 groups, resulting in 7.4 (!) people per group. Not a significant sampling, huh? Second, the data was mostly self-reported (“perceived sweetness, hunger and satiety profiles, or energy intakes at lunch”). No analysis of insulin, leptin or other biochemical markers was included. Third, the study was (surprise) supported by a grant from the American Beverage Association, by the Corn Refiners Association, and by fellowship T32 DE07132 from the National Institute of Dental and Craniofacial Research (to PM). Yowza. Could I put in a plea for this SkokieGuy to join Shaping Youth’s consortium of media mental floss to get people to see things clearer when it comes to the ‘big picture’ of undercurrents, motivations, and persuasive techniques working at cross-purposes in kids’ health? “And let us not forget that virtually all corn grown in the USA is genetically modfied. Since no labelling is required, we are ingesting a staggering amount of GMO products, via the HFCS that is in virtually all prepared foods. My take on our food supply, be it HFCS, irradiating food, GMO organisms, cloned milk or beef, is that the government allow consumers to make their own decisions and require labelling, so we can make a choice about what we consume. It’s about media literacy over limitation, logic over lingo…and ADDING to the age of conversation to build on our collective knowledge! · Is it a natural product? Is eating HFCS harmful? · Why are they doing this now? HFCS has been on the market since the 1970s. · How do I eat HFCS products in moderation? · Karen Collin on Sugar, corn syrup, or calories? “I am reading an article from Lazslo Pentek, a Beekeeper who has an opinion about HFCS. Ed Brayton over at Scienceblogs on Government Subsidized Obesity, Debra at The Ethicurean on this specific ad campaign, The Organic Consumers Association article on Corn, Used and Abused. I’ll add The Accidental Hedonist into this (and her new post, “It’s Water! Now With HFCS!”) as well as the Expatriate’s Kitchen which has an absolutely DON’T MISS Childhood Nutrition Series and of course, our own nutritionist/healthcare blogger, Rebecca, below. Again, I’m not expecting this level of thoroughness with every ad schpiel deconstruction…but BlogHer’s Gena Haskett (see her multiple blogs here) is near and dear to my heart in the media maven/research realm of unearthing data and overturning rocks to question assumptions and think for yourself! Her evidentiary quest fits well with ours here at Shaping Youth, so Gena, come guest blog ANY ol’ time, eh? We’d sure love to have you! Point is: EVERY parent-child-educator needs these media intake skills to be able to snap their brain into critical thinking regardless of the topic…current affairs, elections, food, fun, teen choices, dilemmas, peer pressure, you name it! It all comes down to evaluation of choices and concious decision making. I’m sure our friends at Decision Education Foundation will clearly agree…Now, here’s Rebecca Scritchfield’s dietary take on the HFCS debate as a healthcare blogger, sports nutritionist and yes, an ‘expert.’ The commentary accompanying the post on her site is worthy, with dieticians weighing in on the dialogue, and a ‘Balanced Health & Nutrition’ approach. Do the new High Fructose Corn Syrup ads throw dietitians under the bus? As a communications expert and future dietitian, this bothers me. While the statement is not technically false, it is twisted. I think it uses dietitians as a way to position HFCS as recommended or even healthy and that’s dangerous for the field. What is “moderation” anyway? It’s subjective. A young, active athlete has a lot more room for “moderation” than a sedentary, overweight 40-year-old female with a family history of diabetes and obesity. White sugar is refined, just like HFCS. The first thing a dietitian is going to do is ask a person to add healthy fruits, vegetables, and grains to their meals and replace them with junk foods of poor nutrition quality -processed sugary and sweet foods – most of the stuff the CRA is promoting as “enjoy in moderation” foods. I think this is an excellent “textbook” PR ad. If I had this assignment in grad school, I would use this same approach. I think it does its job to reach those “on the fence” to view HFCS positively “oh, ok fine in moderation”. But it is not good for the reputation of dietitians. It leaves the perception that dietitians are “in bed” with food companies. Perception is reality. Just like HFCS is perceived as unnatural or even poison dietitians could be perceived as thoughtless drones who are afraid to say “eat less” of anything – and that’s just not the case. Serious Eats – the reader comments here indicate what’s going on with HFCS. Strong opinions that it is unnatural and discussion about whether or not it is “different” than other sweeteners. BlogHer – opinion about how the ads are perceived as insulting – most likely by people who choose to avoid HFCS. So if the campaign goal is to shift some opinion positively toward HFCS, it may be failing. About Rebecca: Shaping Youth is proud to have Rebecca Scritchfield as part of our stable of guest editorial bloggers in core areas of expertise we deem integral to children’s health. Rebecca graduated with degrees in chemisty and nutrition with honors and distinction, and has additional academic training in communications and information technology. She’s certified by the American College of Sports Medicine, pursuing a graduate degree in communications at The Johns Hopkins University, with an emphasis of coursework in digital technologies and health communication, and is also a guest blogger for the diet and nutrition section of Health Commentary, led by family physician Mike Magee, MD. WNBC/NYC: Why Is Corn Syrup In So Many Foods? Mayo Clinic: Why is HFCS So Bad For Me? Sugars and Satiety: Does the Type of Sweetner Make A Difference? The Daily Green: All Natural Junk Food? Dr. Robyn: How Much Sugar Is In My Child’s Juice? Dr. Robyn: How Much Sugar Is In My Child’s Food? Thanks for more good stuff on the evils of HFCS. As for solutions, just read an important stat on prevention from RWJF.org and the Yale Rudd Center that cites a direct return on investment of $5.60 for every $1 spent in prevention…which could keep us from bankrupting the health care system over the long haul..so I’m all for tryin’! Okay, so AdRants has a wonderful little riff going on in the comments section of their blog, including a basic PR reiteration by the Corn Refiners’ crew…Here’s the link…I don’t know if it’s subscriber based only, but if so…ping me and I’ll reprint the comments here.